Perhaps nothing is more frustrating than finally constructing the pond or lake of a lifetime only to find that it doesn't hold water. Just as frustrating are pond leak repairs and repair theories that do not hold water. Contact us for information on our Pond Leak Evaluation and Repair Planning. We focus our leak location and repair strategies in 2 main areas - 1) SYNTHETIC LINED BASINS from small garden ponds to multi-acre ponds and lakes. 2) NATURALLY LINED BASINS - can be excavated ponds or lakes with no dam embankment or a pond or lake constructed with a dam embankment. How do you locate the pond leak? This can be exceptionally simple or painfully difficult depending on the situation. Let's state the obvious and move on from there - look for the wet spots around the pond. A soil probe will allow you to find moisture below the surface. If you do not have access to a soil probe, a ditch shovel will work just fine. Probe or Dig as deep as you can in the suspect area and examine the soil for moisture content. 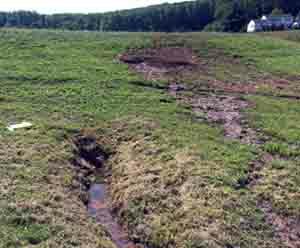 The best time to look for moist areas around the pond is after an extended dry period - preferably a week or more. If you find significant moisture, you are likely in the vicinity of the leak and can narrow your search. Pay attention to vegetation around the leaking pond. Lush green vegetation during extended dry periods can help you locate the pond leak as well. Once you've narrowed the search or if you just can't narrow the search, allow the pond water surface to fall without replenishing the water until the water level stabilizes. Mark this level and investigate the pond around this elevation. For a synthetic liner pond, you have found the elevation of the pond leak, careful inspection of the liner at this elevation should allow you to find the leak. If you have an EPDM rubber liner (Firestone Pondgard or similar) with a small hole the repair is quite simple once you've found the leak. Purchase the EPDM Rubber Liner Repair Kit and apply per the instructions. If this is the only leak in your pond, you may refill and enjoy! Contact us for larger holes and we will assist you with the proper materials and techniques for the leak repair. If the pond is a natural bottom or clay lined pond, the search becomes a little more complex. As with the geomembrane lined pond, it is worth examining the pond at the elevation where the water level stabilized. There are 2 reasons that the water level may have stabilized at this level. 1) this is the elevation of the leak or 2) this is the natural groundwater elevation (water table). A simple pump test will determine with reasonable certainty whether or not the pond bottom has intercepted and is connected to the water table. Mark the starting water surface elevation and ending water surface elevation. Over the next 24-48 hours monitor the water surface carefully. If the water surface rebounds toward the starting point, the pond has most likely intercepted the water table. If the water surface stays at the same elevation, the initial water surface elevation is the elevation of the leak. First, let's dispel a common misconception. Sprinkling a modest amount of bentonite in almost any of it's various commercial forms into standing water is unlikely to stop or slow a pond leak. Bentonite is a natural expanding clay found in Wyoming which does have a role in repairing leaks and sealing water bodies. To be certain, it is a great product when used properly. Click here for pricing of bulk bentonite clay. If you want to attempt to seal a pond bottom without draining the water, Soilfloc, A two-part polymer may be the best option. To properly apply bentonite for ponds, the pond must be drained and the bentonite then incorporated into the soil of the pond bottom and sides. The application rate for bentonite ranges from 2 pounds to more than 5 pounds per square foot depending on the soil characteristics. For clayey and silty soils, 2 pounds per square foot MAY be sufficient. For sandy soils 4 pounds MAY be sufficient and for soil containing gravel and rock, in excess of 5 pounds will be required to obtain a seal. Once the bentonite is applied, the soil should be disk harrowed to mix the soil and bentonite and then compacted. Alternatively, a continuous blanket of bentonite can be applied to the soil and then carefully covered with clean soil or sand to prevent the clay from mobilizing into the water column. More details on bentonite clay application. In many cases, the cost of properly applied bentonite is as much as a properly installed geosynthetic pond liner system. Geosynthetic liner such as EPDM Rubber provides a completely impervious barrier for maximum water retention. The liner systems are field seamed in large panels and can be constructed to virtually an size. Once completed a geosynthetic liner can be covered with soil or rock which completely hides the liner system from view. The EPDM rubber pond liner referenced above carries a 20-year manufacturer's warranty and, in field tests, the liner lasts significantly longer than 20 years. Using the two-part polymer to seal the pond bottom soil is the most effective technique that does not require the pond to be drained. The polymer is applied by broadcasting over the pond surface. As the polymer is applied the two components react with water and begin to work. Part A, is an absorbing polymer which swells when exposed to water. This part, lodges in soil pores and swells to begin to seal the pores. Part B is a polymer that has a positive charge that will attract and hold negatively charged clay particles. This attractive, Part B Polymer, works over time by continuing to accumulate fine particles in the pond bottom to further seal the pond bottom. If applied during initial construction, the polymer can be used as a dry soil additive to improve the pond seal. Learn more about pond bottom sealing here. For a leaking embankment, if the location of the leak has been identified, it may be possible to construct a core trench in the embankment to slow the leak. 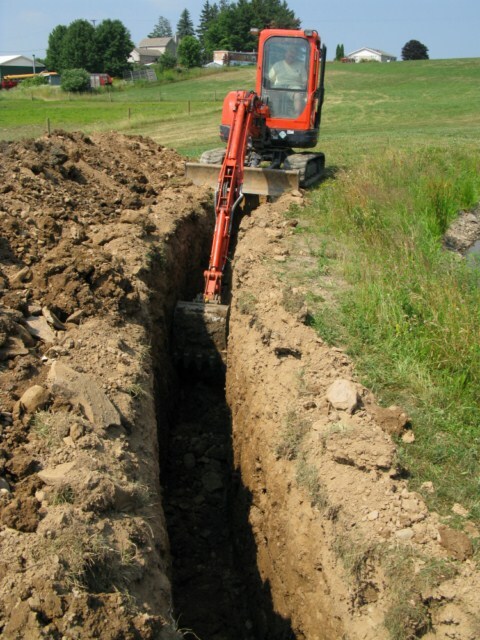 To install a core trench, excavate a minimum 24 inch wide trench to ate least 2 feet below the pond bottom elevation. The trench should be located as far back from the pond edge as possible while still remaining on the flat top of the embankment. The goal is to create an impervious core in the embankment which will not allow water to pass through. This impervious core can be created in a number of ways. Bentonite can be mixed with the excavated soil at a rate of 30% bentonite and 70% native soil. The material should be placed back in the trench and compacted with a trench roller, whacker, or excavator bucket in 6 inch lifts. Alternatively, EPDM liner can be buried in the embankment by draping a solid sheet of EPDM liner along the trench wall closest to the pond and carefully backfilling the trench. Again, the soil should be compacted as the trench is backfilled. Applying a bentonite mix at the bottom of the liner curtain and at the ends of the liner curtain will help to prevent water from seeping around the curtain. All pipes that are installed through the pond embankment should be fitted with an antiseep collar to prevent water from flowing along the pipe. If a pipe is installed through the embankment without an antiseep collar, the pipe can be excavated and a bentonite clay plug installed around the pipe. Ideally, the bentonite clay plug should extend at least 3x the pipe diameter around the pipe. In some situations, it may be more effective to install a well or surface water intake to provide make-up water. There are a variety of automatic control systems that can be used to operate a well pump or valves to provide water to the pond. Surface water intakes can be constructed even if a gravity flow system is not feasible. Natural Waterscapes has installed a variety of pump-up systems to stabilize pond water surface elevations. Contact us for details on our Pond Leak Evaluation and Repair Planning Services.